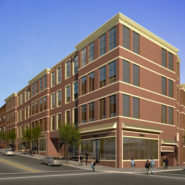 Queen City Lofts is designed in a way that will help the artists grow and prosper at their profession. The Project is designed as a community setting, which will foster a strong sense of community. The lobby of the building, which fronts on Main Street, will also act as a Gallery space for the resident artist to show their work at no cost. This design will capitalize on the already thriving artist community in the City of Poughkeepsie.